As the result of SIB’s remit on advice and development work the integration of social clauses has become a political expectation. The introduction of social clauses in public procurement is a key objective in the Programme for Government 2011-15, however there is currently no lead Department that undertakes the development of social clauses. There is significant spend in public procurement, it has been increasingly recognised by the Executive that if this spend is used wisely it can be a powerful driver for social and economic change. As a result of SIB’s remit on advice and development work there is an expectation that the organisation will continue to champion this work. This then became integrated in the letter of expectation from the First & Deputy First Minister which mandated SIB to continue to work with Department and other key stakeholders to develop this work further. The ‘Buy Social’ toolkit was launched in January 2015, by OFMDFM (now TEO) Junior Ministers. SIB is championing ‘Buy Social’ across the public sector. 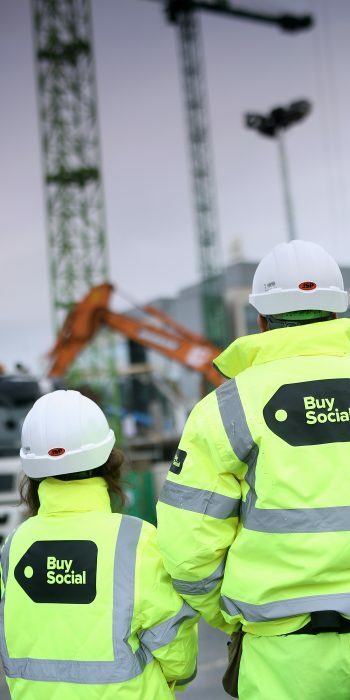 With the launch of the ‘Buy Social’ toolkit and the review of social clauses it is anticipated that this will further increase the political expectations to take forward the ‘Buy Social’ agenda. SIB will continue to provide support to key stakeholders including Departments, Local Authorities and the private sector to assist them in the integration and design of social considerations from the earliest stage of the project/programme.